This was a very bold move. Not only was this painting startlingly original and different, but it visited a motif which had not long before resulted in Ingres’ success at the Salon, in 1827. 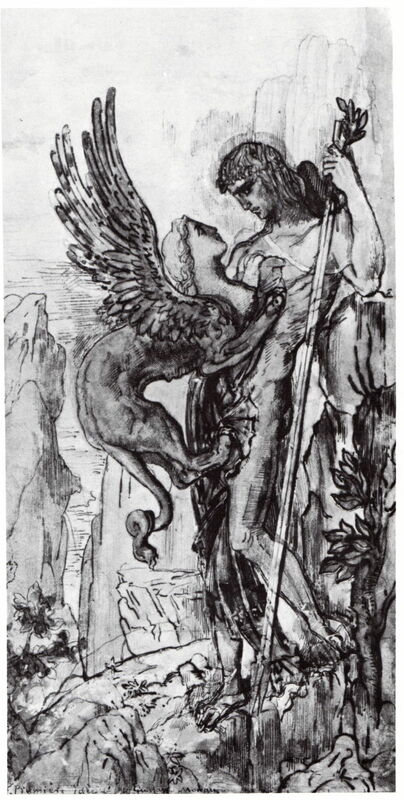 Just as Oedipus is seen to be staring out the fearsome sphinx, so Moreau was visibly challenging his seniors. 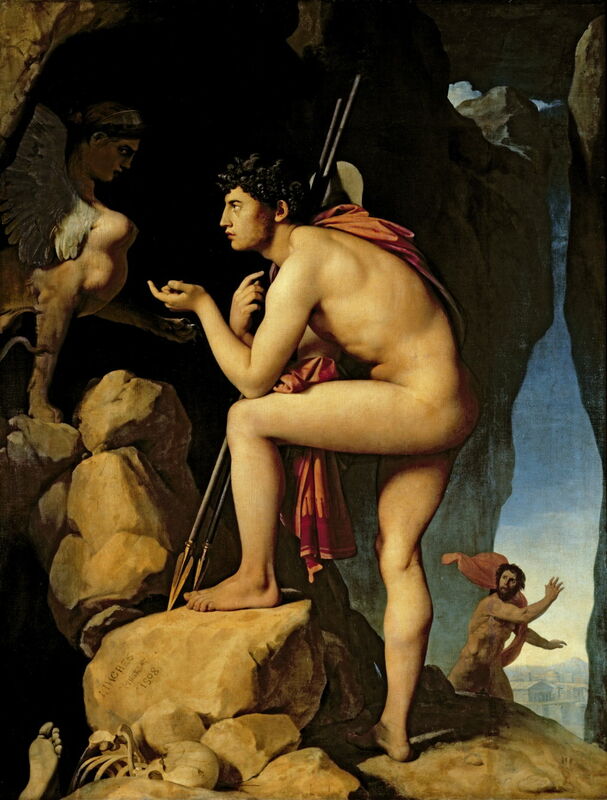 Unlike Moreau, Ingres had won the Prix de Rome, and in 1808 sent back to Paris a full-size figure study of Oedipus. In 1825 he decided to rework that painting, having the canvas enlarged, and turning it into the more elaborate narrative work now in the Louvre: that is the painting which Moreau must have known. An earlier oil study, now in the National Gallery in London, was unlikely to have been accessible, and a later reversed copy (with significant differences in its details) was not commissioned or painted until 1864; that work is now in the Walters. Ingres’ 1827 version had been well-received when it was shown at the Salon that year. Oedipus solved this in his answer of humans, who crawl when a baby, walk on two feet as an adult, then walk with a stick when old. The defeated sphinx then threw itself into the sea below, Oedipus entered Thebes, was awarded the throne of Thebes in return for destroying the sphinx, and married its queen Jocasta, who turned out to be his mother. Moreau’s painting contains a potentially narrative scene with elaborate and quite intricate symbols, and is painted in an archaic style which is generally referred to as resembling that of Andrea Mantegna. 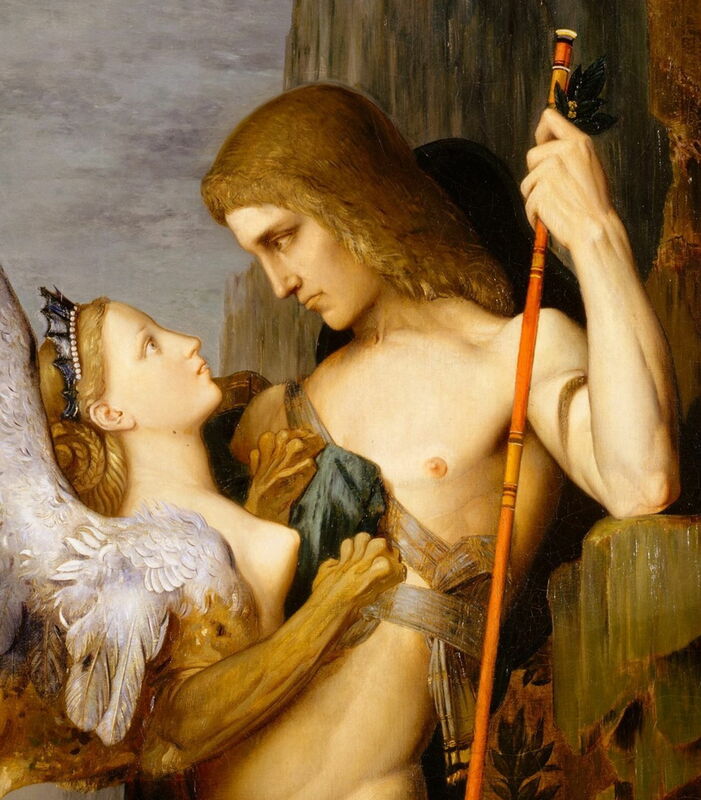 Gustave Moreau (1826–1898), Original idea for Oedipus and the Sphinx (1861), further details not known. Wikimedia Commons. Several earlier preparatory drawings have survived, including this quite mature watercolour from 1861. Being completely devoid of symbols, but very close to the final composition, it suggests that Moreau did not view the symbols as being essential to the appreciation of his painting. This was just as well, as the reviews published after the Salon reveal that, at the time, few read its symbols successfully. Discussions of its narrativity have claimed that it departs from the theatricality which Moreau’s new type of history painting was determined to avoid. The first question to be answered, then, is whether it is a narrative painting. To meet the criteria, it must refer to two or more moments in the story, something which is accomplished by the inclusion of the body parts at the foot of the canvas. Those refer to the track record of the sphinx killing those who have been unsuccessful in answering its riddles. There is also one potential forward reference, in the distant glimpse of Thebes beyond the chasm in the rock at the lower left. Classical narrative principles would then have the story told by facial expression and body language, at a ‘pregnant moment’. The apparently emotionless faces of Oedipus and the sphinx are not an attempt to reject facial expression as a narrative tool. In fact, they confirm its value. The pair are engaged in staring intently into one another’s eyes, in the way that poker players might, almost eyeball to eyeball. The most plausible moment to be shown here is the brief interval between the sphinx asking its riddle, and Oedipus answering it. The sphinx is already latched onto the front of what it comfortably assumes is going to be another, rather delectable victim. Its forelegs are ready to reach up and strangle him once he guesses the wrong answer, and its hindlegs are ready to unsheath claws and walk up, burying those claws in his abdominal flesh. The sphinx is ready to prove itself as a real femme fatale for Oedipus. Around this central narrative core, Moreau feeds us symbolic morsels which supplement that main course, but do not supplant it. Behind Oedipus is a bay tree, sacred to Apollo, representing man’s highest achievements; behind the sphinx is a fig tree, a traditional symbol of sin. The small polychrome column at the right is topped by a cinerary urn, symbolising death, and above it is a butterfly, representing the soul. Ascending the column is a snake, again associated with death, and through the biblical serpent, with sin. Did Moreau avoid theatrical narrative? There was no action to be shown in this story, as the whole point of the story was that Oedipus dodged the action by answering the riddle correctly. The moment shown is the story’s crux, climax, and potentially its peripeteia, no less. So it was Moreau’s choice of story which determined whether he avoided showing action, in this case. 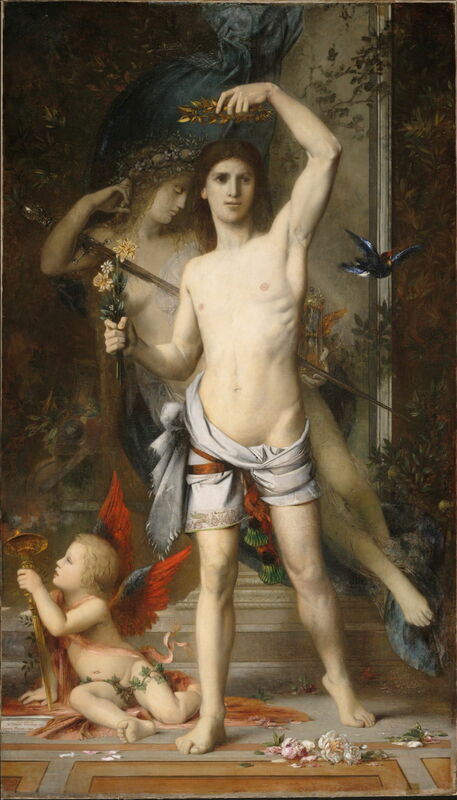 After the resounding success of Oedipus and the Sphinx, Moreau completed the painting which he had started just a few weeks after the untimely death of his friend Théodore Chasseriau in 1856, in his memory: The Young Man and Death (1856-65). 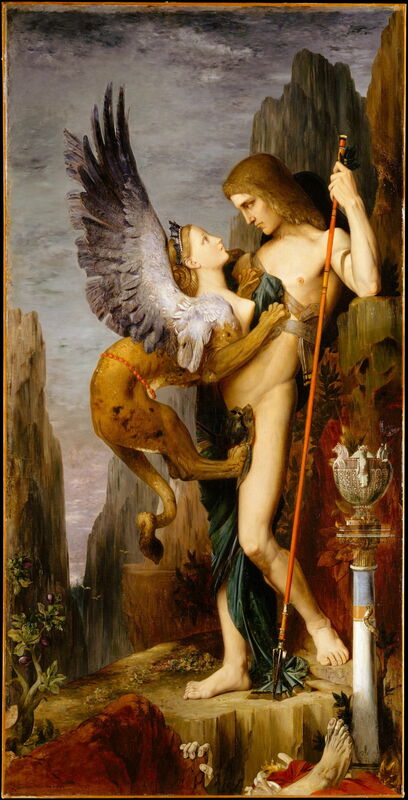 Gustave Moreau (1826–1898), The Young Man and Death (In Memory of Théodore Chasseriau) (1856-65), oil on canvas, 215.9 x 123.2 cm, Harvard Art Museums/Fogg Museum (Gift of Grenville L. Winthrop, Class of 1886), Cambridge, MA. Courtesy of Harvard Art Museums. Narrative has gone, in this idealised and symbolic work, with a wholly unrealistically youthful Chasseriau stood in the foreground, holding a golden laurel wreath above his head, a bunch of flowers in his right hand. Originally, the figure of death appeared where there is now a young woman playing the sistrum, behind the young man. Moreau decided by the end of 1856 that this would “be more cheerful and engaging”. The end result is a curiously static image which doesn’t really read in any sense, other than its inevitable lament over premature death. 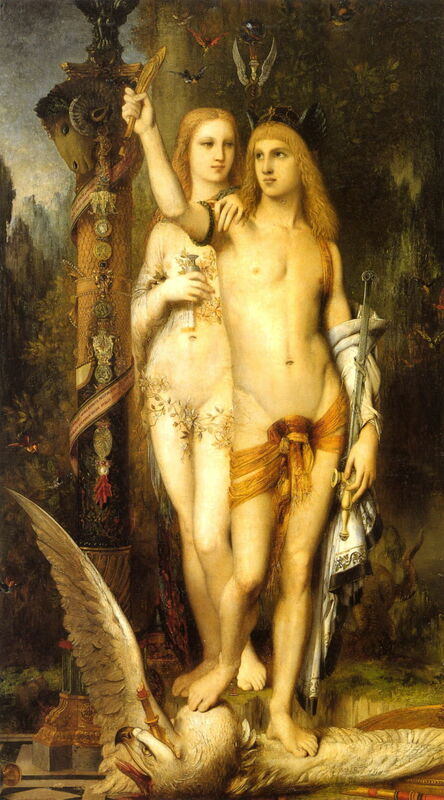 The second painting which Moreau showed at the Salon in 1865 was his Jason. The name Jason refers, of course, to Jason of Golden Fleece and Argonauts fame, a series of swashbuckling adventures which offer many opportunities for theatrical narrative painting. Moreau avoids them all, and shows us a static Jason, with Medea stood behind him, nor a Golden Fleece in sight. Instead of providing narrative, the artist offers us symbols as clues to what might be going on. The broad outline of Jason’s story is simple. When he reached Colchis, he underwent a series of trials imposed by King Aeëtes, culminating in Jason’s victory over the dragon which guarded the Golden Fleece. These were accomplished with the help of Medea, the King’s daughter, in return for a promise of marriage. In spite of her odd omission from the title of the painting, the almost naked woman behind Jason is Medea, the sorceress who has fallen in love with the hero. The ram’s head at the top of the pillar on the left signifies the Golden Fleece, and the dragon which guarded it is shown as the eagle on which Jason is standing, with the broken tip of his javelin embedded in it. This is the more confusing, as in the original story the dragon was put to sleep by one of Medea’s potions, rather than being killed with a javelin. 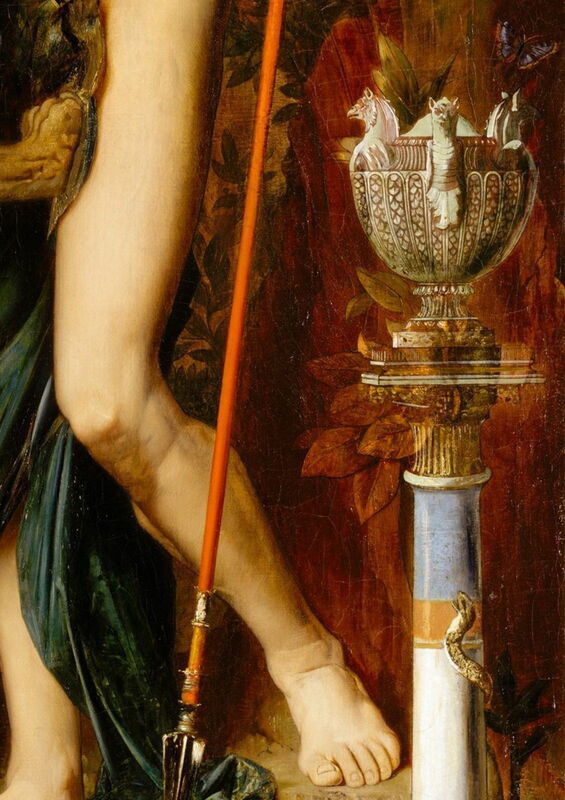 Yet Medea holds a vial in her right hand, and her body is swathed with the poisonous hellebore plant, one of the standard tools of witchcraft. These may allude to Jason’s future rejection of Medea and her poisoning of his replacement bride, but there is a lot of story between this moment and that later episode, so that is speculative and hardly clarified by the painting. These could be interpreted as suggesting that the painting should be read in terms of the conflict between Jason and Medea: Medea expresses her subjugate trust in him, whilst Jason considers her to be just another spoil won alongside the Golden Fleece. Still more puzzling is the spattering of other details, of hummingbirds, the sphinx on top of the pillar, medals decorating the shaft of that pillar, and more. Some appear merely to be decorative, but drawing the line between the decorative and the symbolic is impossible. The end result in Jason is almost the opposite of Oedipus and the Sphinx: the latter consisted of a clear narrative which was then lightly embellished with symbols, the former relied on the interpretation of symbols to construct any narrative; as those symbols conflict with the original narrative, the viewer can readily become bewildered. This was not a return to a better form of history painting, but the loss of narrative into the risky interpretation of symbols. For Moreau with his two paintings, the 1865 Salon did not provide the consolidation for which he had hoped, although much of that was the result of an accident of history: dominating all discussion of that Salon was another painting, Manet’s Olympia. Posted in General, Painting and tagged Chassériau, history, Ingres, Manet, Moreau, myth, narrative, painting, symbolism. Bookmark the permalink.